I put up this bounty over on SO with the assumption that the text would be formatted like it is for a question or answer. I'm not really sure if I was incorrect in my assumption, or if I just formatted my text improperly, as I can't go back and edit what I put in. Am I missing an obvious feature? If not, would it be reasonable to request bounty-text edits—perhaps with moderator-approval to prevent abuse? That would allow honest folks to catch perhaps up to 95% of all minor (often formatting) mistakes, without a (big) risk of people investing wasted time to score a bounty while finding out later the bounty requirements changed a lot. 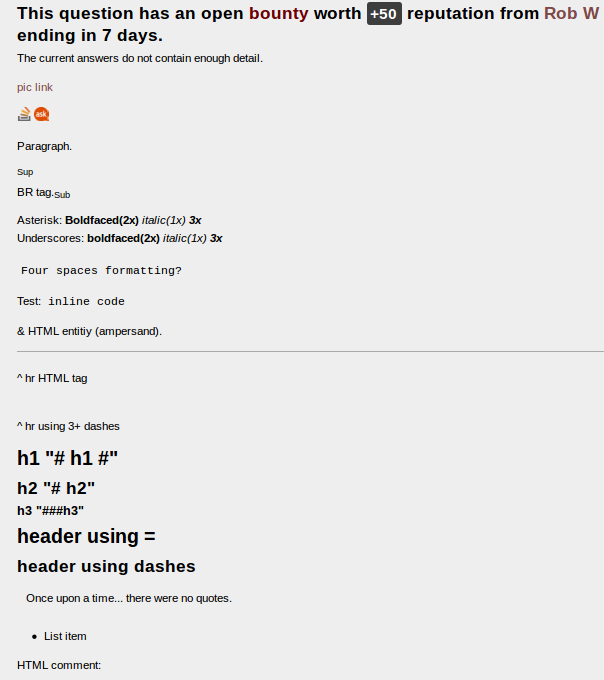 Despite earlier (deleted) tests that showed paragraphs and even block quotes were supported, I just learned that since January only mini-Markdown is supported, very much like comments. 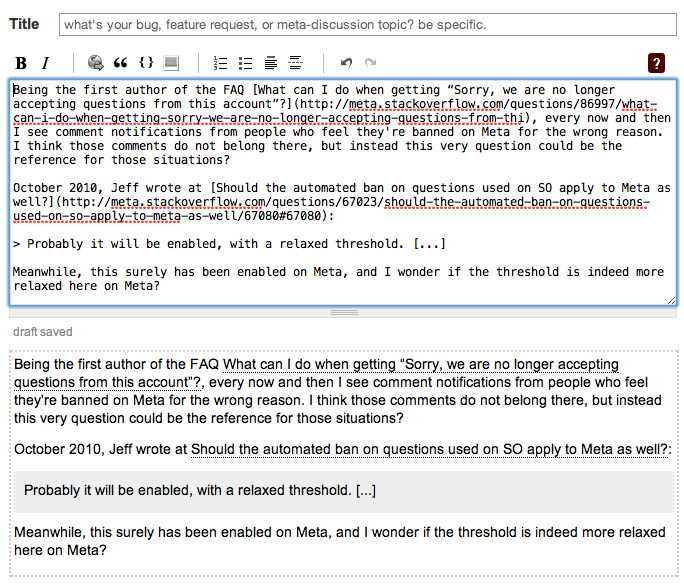 Earlier today, I even used the preview question editor to ensure my Markdown was fine. Still then, the paragraphs and blockquote got lost in the final result! I'd love to fix that. Not the answer you're looking for? Browse other questions tagged feature-request bounty bounty-remarks . How to edit (or request an edit to) a typo in a bounty message? Can I revise/edit the custom message on bounty question? Why was the bounty awarded in this way? Editing bounty messages, is it finally time for a little “Love”?